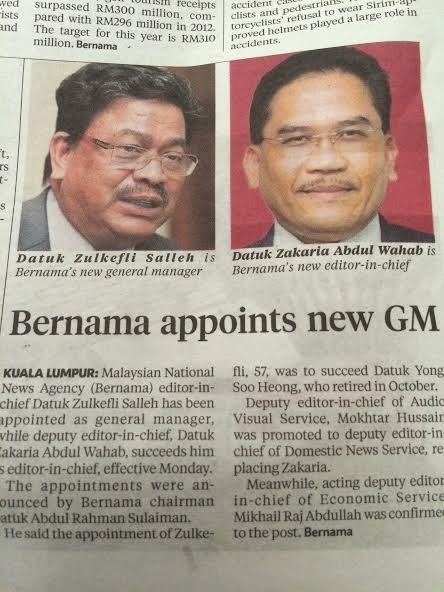 Bernama in good hands but at BernamaTV, is the end near? I wrote about The next Editor-in-chief of Bernama two months ago and am thrilled to read that all the names I mentioned in that posting figure prominently in the new line-up. Congrats Zack, Mokh, Mike and Zul. Datuk Zakaria Abdul Wahab, one of Dr M's press secretaries until 2013, joined Bernama on 1 July 1980. Mokhtar Hussain is the current president of the Naitonal Press Club. But while the national news agency is looking solid, things at Bernama TV aren't improving. I hear the staff have not been paid for the last three months, betul ke!? Sad, if true. Back in 2011, when Rais Yatim was the minister in charge, Bernama TV was already having this problem (read h e r e). I hear Shabery Cheek, the current Information Minsiter, is planning to come up with radical changes to turn around the fortunes of the company. I have faith in Shabery. But whatever he plans to do can wait, for now. What cannot wait is the salaries of the staff. Pay up, asap, please. In good hands? Yeah... One is well-known for protecting and promoting his cronies, the other got past scandal. Where is Bernama integrity? Bernama TV just closed it, no benefits to the country. So many news channet. RTM, Media Prima, Al hijrah, Astro etc etc. whay waste fund for a Bernama TV. Better Bernama TV compete in online portal with Malaysia Insider, TMi etc etc and made history. How come our Datuk was overlooked ?